Deb's Cup of Tea: MINE! My feet have been more cold this winter than usual. Yes, it has been quite an unusual winter with a blizzard and some extra cold days. You know that when your feet get cold, it can take awhile to warm them and the rest of you still feels cold. I've taken to wearing socks to bed to get them warm and keep them warm. But what to do when gaming. I have the windows covered. I checked for drafts and I seem to have closed those obvious sources. As we all know, heat rises so the floor is always going to be cooler than the ceiling. Still, I'd like my feet to be comfortable when I play WOW. Then I hit on it. 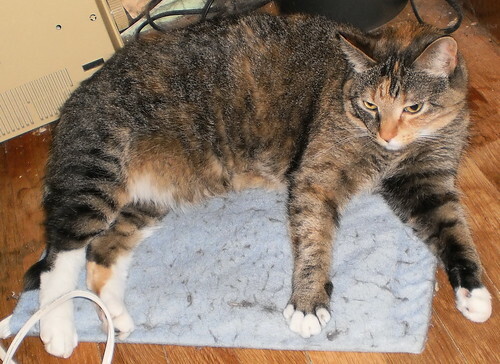 A heating pad. Set to setting #2 out of 4, it keeps my feet warm or warms them up without a lot of excess energy usage. It's been perfect but I've run into a problem, a 10-pound problem. Pilchard doesn't care but I have accidentally kicked Mija I don't know how many times because I don't know that she's confiscated the heating pad. She doesn't stay there through a night of gaming. She leaves after awhile and I can warm up my feet or keep them warm. Oh the side effects of living with cats.